We had an excellent lunch today at our old friends' Malcolm and Moira Hooper's home on the Helford River. Malcolm was one of my MSc Mineral Processing students at Camborne in the 1980s and is now an independent minerals industry consultant. 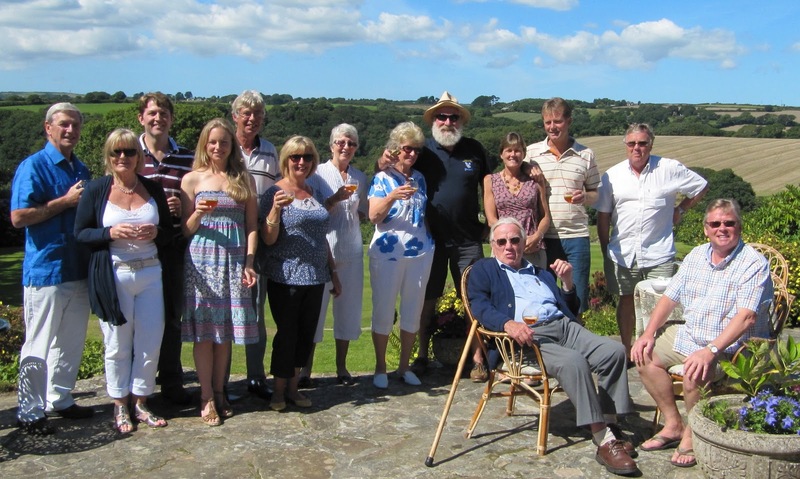 It was a wonderful occasion, as Malcolm and Moira had brought together many well known personalities from the minerals industry, based in, or having very strong connections with, Cornwall. Left to right in the photo are: Dave and Diane Chilcott (Dave is an Associate of Wardell Armstrong International (WAI) Cornwall, and was General Manager of Mufulira Mine, Zambia, from 1986-1992), Owen Miholop, mining engineer with WAI, and fiancee Anne Boulter, Environmental Scientist at WAI (who are to be married on Saturday), Mark Owen (geologist at WAI), Pauline Clarke (wife of Nick), Barbara Wills, Moira and Malcolm Hooper, Adele and Phil Newall (Phil is manager at WAI, and was involved with the early MEI Conferences), Nigel Clarke (brother of Nick). Seated are Roy (father) and Nick (son) Clarke (Nick is with Central Asia Metals plc and was very much involved with the early CSMA/MEI Conferences). Is minerals engineering the world's most important branch of technology? Is minerals engineering the world’s most important branch of technology? This is intended to be a leading and provocative question. I have been following a discussion on the LinkedIn group Minerals & Metals Professionals Globally on the worldwide shortage of mining engineers. There is a similar shortage of minerals engineers, as testified by the long list of job vacancies on the front page of MEI Online. All Universities are in agreement that it is very difficult to attract students into the minerals industries. There aren't that many engineering degree courses out there to produce the next generation of minerals engineers. Mining is perceived as being dangerous, and the industry as a whole environmentally unfriendly, and is “ruining the planet”. One of the correspondents quotes his sister as speaking of his profession as the “dark side”. What is the answer to this, and how should we go about attracting students into the minerals industry, rather than into cushy city jobs? We should forcefully remind all detractors that mining companies do not mine for fun- it is a tough, dangerous business, as everyone knows after the recent events in Chile. The minerals industry serves society- without it society as we know it wouldn’t exist, as everything we use in our daily lives is either mined or grown. Ask any pre-University student what is the most important branch of technology, and the answers will probably be computer science, electronics, genetics etc. What needs to be impressed on them is that without the minerals industry these branches of science and technology would not exist- they are totally dependent on sophisticated electronic instruments which need metals of every description. As ores become ever more complex and refractory it could be argued that the minerals engineer, whose job it is to economically extract these metals holds the key to sustaining and advancing modern society. Recycling also plays its part, but again it is the minerals engineer who has the key role, and recycling also presents immense technological problems- for instance how do we economically recover small amounts of elements such as lithium and germanium from used computers? I would recommend that University academics take the time to speak to students in schools, and that the Institutes and mining companies provide the funding to do this. There was a great shortage of minerals engineers in the 70s, due to the great mining boom, and many mineral processors were graduates in chemical engineering and physical metallurgy (I was one of them). 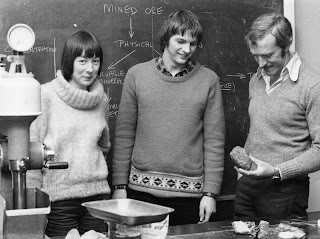 During the 70s and early 80s, when I was a young lecturer at Camborne School of Mines (CSM), I was involved with an organisation called the Minerals Industries Manpower and Careers Unit (MIMCU) led by the late Geoff Cox. I discovered many years later that MIMCU was covertly funded by the South African Chamber of Mines, to recruit UK graduates to its, mainly, gold mines. MIMCU arranged and funded parties of students and their teachers to spend weekends at CSM to gain insights into mineral processing. The University of Birmingham was also very much involved with visits to the Ecton Hill copper-lead mine in Staffordshire, where I first met the very enthusiastic Terry Veasey, a senior lecturer at Birmingham. I also spent a lot of time visiting schools, showing students how their fundamental science knowledge could be utilised in a challenging field such as mineral processing. I can honestly say that I recruited to CSM at least one student from every school that I visited. So my eponymous question, although provocative. was intended to encourage discussion and to get academics out on the road again. There is even more incentive now to present papers at MEI Conferences after MEI and the Southern African Institute of Mining and Metallurgy (SAIMM) forged an alliance for publication of final papers. All papers presented at MEI Conferences are published in draft form in unrefereed Proceedings, available on CD. Copyright on these papers belongs to the individual authors, and not to MEI. Authors are also invited to submit final papers after the conference, edited as a result of discussions at the event. Submission to Minerals Engineering, the world's number 1 journal in mineral processing and extractive metallurgy, with the highest impact factor, and rated a maximum A* by the Australian Research Council. These papers are refereed, and, if accepted, published in special issues of the journal. Submission to the Journal of the Southern African Institute of Mining and Metallurgy (SAIMM). The Journal is a recognized Department of Higher Education and Training accredited journal, with ABC accreditation by the Audit Bureau of Circulation of South Africa. The content of the Journal comprises Transactional and Journal papers. Transactional papers are of a very technical nature and are subject to stringent reviewing procedures while journal papers are of a more general and practical nature and go through a less severe reviewing process. These publishing options come into force with the 3 MEI Conferences in Cape Town in November. The past year has seen many new faces at MEI Conferences; we believe that networking is at the heart of this, not only at international conferences but also through the professional networking site LinkedIn, which is now the major player in bringing professionals together via the internet. LinkedIn can be thought of as a huge virtual conference, attended by millions of people directly or indirectly related to your profession, with ‘virtual coffee breaks’ where you chat with old friends, and make new ones, and more serious discussion sessions in specialist subject areas. First of all, for those not acquainted with LinkedIn, let me show you the basis of how it works. Registration is simple and free. Once you are registered, take time to produce a good profile of yourself. Your profile will be visible to other LinkedIn members, and you will also have a public URL, which you can use outside LinkedIn, in your email signature etc. As an example view my public profile here. You need to invite ‘connections’- people that you have worked with, or are friends. If you are a minerals engineer, take a look at who is in the Minerals Engineers group- you will be surprised how many people there are there who you will know. The Groups are the serious side of LinkedIn; here you can join specialists in your field to discuss a wide range of topics. Again, have a look at Minerals Engineers, Minerals and Metallurgical Professionals Globally, as well as more specialist groups such as Froth Flotation, Grinding Mills Technology and the Institutes, such as AusIMM. Once you are set up, how do you use LinkedIn to get the most out of it? Using the virtual conference analogy, if you do nothing, LinkedIn will give you little in return- you are the wallflower at the virtual conference, sitting in a corner sipping your virtual coffee. The more proactive you are, however, the more you will gain. The two main areas in LinkedIn are the Groups and your personal updates. The latter is a little like social networking on Facebook, but is a valuable and often overlooked area of the site. It is the ‘virtual coffee break’. If you add a short update or question e.g. “will any of you be at next week’s conference in Australia?” this can be seen only by your connections. If one of your connections comments on this, however, the comment will be visible not only to your connections but also to his/her connections, and this is where the real power of LinkedIn lies. I currently have 487 connections, but my home page tells me that my ‘network’ contains over 2 million professionals. My network is my connections (primary connections) and their connections (secondaries) and the connections of the secondaries (tertiaries), as well as members of any groups that I join, who will also see my updates. I am currently testing the power of this. Five days ago I added an update asking my connections to comment ‘seen’ if they saw my test update. Their ‘comments’ were seen by their connections, and so on, and at the moment over 10,000 people have replied ‘seen’, and the list is still growing rapidly. So to get the most out of LinkedIn, spend a few minutes each day adding your updates, or commenting on the updates of your connections, and taking part in, and initiating, discussions. If you do this the rewards will be substantial, in meeting new contacts, renewing old ones, developing business relationships and generally enhancing your presence in your specialist field. I note for example that 350 people have viewed my profile over the past day!! I invite other LinkedIn users to share their experiences in gaining the most out of this extremely valuable facility. We welcome Magotteaux, a Belgium based company, as 2nd corporate sponsor of Comminution ’12, which will be held in Cape Town in April 2012. The other corporate sponsor is Starkey & Associates, and media sponsors are Industrial Minerals and the Gold & Minerals Gazette. Magotteaux is a pioneer in advanced ceramic, metal and composite materials, specialising in grinding media and wear resistant castings. I heard only today that Prof. Ross Smith, formerly with University of Nevada-Reno, had died last year at the age of 82. 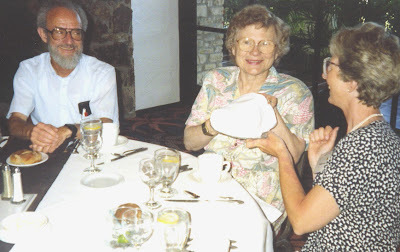 Ross was an interesting and amicable fellow, who I had quite a bit of involvement with in the 1990s. I first met him in Santa Barbara, California in June 1991, at the Engineering Foundation conference on Mineral Bioprocessing, and a few months later he presented a paper on microorganisms as chemical reagents at Reagents ’91 in Cornwall. At this meeting Ross suggested that we hold our annual Minerals Engineering conference in Lake Tahoe, USA, which we duly did, with great success in 1994. I enjoyed Ross’s company, and I am sad that we lost touch after his retirement from academia. 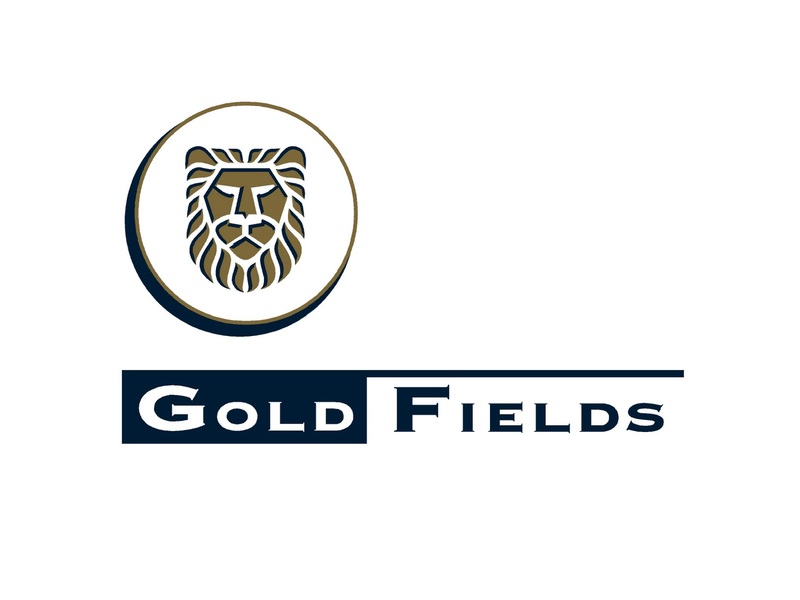 We welcome Gold Fields, the latest MEI Conferences sponsor. 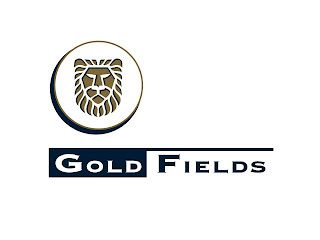 Gold Fields has agreed to sponsor Biohydromet '10 in Cape Town in November. This is promising to be an important conference, which has already attracted a very strong international programme. Biohydromet '10 immediately precedes Process Mineralogy '10 at the same venue. Over 4 years ago, someone asked the question on the MEI Online Forum: are mills still designed using the long-winded Bond Test? With modern computers and models, is this test, and indeed the Bond Work Index, now obsolete? There were a number of replies to this question, but, four years on, I wonder what the current view is on this? We apologise for the lack of news items on MEI Online over the past few days. We have had a major computer crash, which has affected our link to the website server. As soon as the problem has been resolved I will put an update onto Twitter- you can also see the latest Twitter news updates to the right of this posting. Are rod and ball mills set to become obsolete? 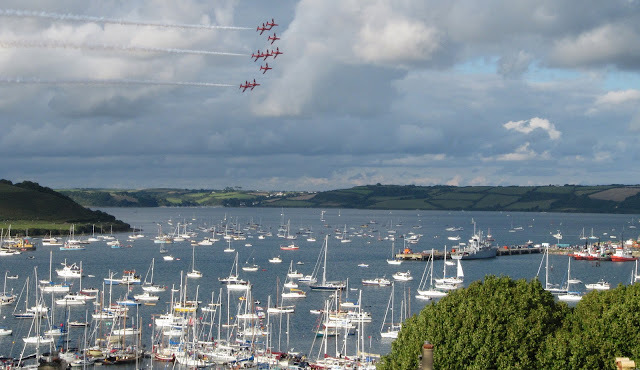 It is Falmouth Week, and the town is crowded with tourists. Particularly last night, when the Red Arrows put on their usual spectacular display over the harbour. There have been great developments in bio and hydrometallurgy in recent years. This is the most researched area of minerals engineering, and is the only minerals engineering discipline to have its own dedicated peer-reviewed journal. I am sure there will be many papers from this field at next month’s IMPC, and November’s Biohydromet ’10 has a very full and exciting programme, with abstracts still coming in. In contrast pyrometallurgy is perceived to be a dirty, expensive process, so I open for discussion: is non-ferrous pyrometallurgy likely to be superseded in the foreseeable future by the new wave of hydrometallurgical and biohydrometallurgical processes? Inspired by a daily column in the UK Times newspaper entitled 'Chatter', which summarises daily trends and 'tweets', I would like to know if you are involved with, or are aware of, any blogs or Twitter sites devoted to mineral processing news, gossip etc? I would like to initiate a regular posting on the MEI blog, highlighting interesting blogs and tweets. Twitter has great potential for networking, but many people are unaware of its uses, as they are deterred by the unprofessional-sounding name Twitter, and even more so by its postings or 'tweets'. Give it a go though, and you might get used to it. I put regular mineral processing news snippets on twitter.com/barrywills, so check it out by 'following' me. During next month's IMPC I will be posting regular tweets on the progress of the event. Mineral processing is rapidly evolving and we at MEI would be interested to know how engineers and scientists keep up to date with the latest developments and news. MEI Online is the world's largest source of free mineral processing news, and currently contains around 12,000 pages of information, both new and archival. The free fortnightly newsletter of updates has over 6000 subscribers and is continuously growing. The MEI blog, a suplement to MEI Online, started last year, and has already had over 35,000 page views, so many thanks to all the regular readers. If you would like to be alerted to news items in the blog, just submit your email address in the right-hand column. If you use Twitter, there are regular updates from MEI, including links to MEI Online headlines. Finally we invite you to join the Minerals Engineers group on LinkedIn, which currently has 550 members, and some very active discussions. Biohydromet '10 is the 5th in the series of MEI biohydromet conferences, and looks like being the most successful. Currently well over 40 papers have been accepted for presentation in oral and poster sessions, covering all aspects of bio and hydrometallurgy of ores and concentrates, and environmental issues. 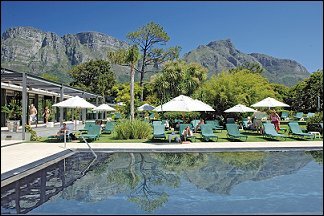 The conference will be immediately followed by Process Mineralogy '10 at the same venue, the Vineyard Hotel in Cape Town. The provisional programme is now available for viewing on the conference website. Process Mineralogy '10 is MEI's 1st International Symposium on Process Mineralogy and is sponsored by ALS Mineralogy, IMP Holdings, Bruker AXS, FEI and Anglo Research. Over 45 papers have currently been accepted for presentation, including two major keynotes. The first keynote lecture will be given by Dr Robert Schouwstra, Manager of Mineralogical Research at Anglo Research, South Africa. His talk will be entitled "Developments in mineralogical techniques – what about mineralogists?" The second keynote will be given by Dr Norman Lotter, of Xstrata Process Support, Canada, CIM Distinguished Lecturer for 2010/11, who will present "Modern process mineralogy: an integrated multi-disciplined approach to flowsheeting". The conference dinner will be held at South Africa's oldest wine estate, Groot Constantia. The provisional programme for the conference can now be found on the website. Process Mineralogy '10 immediately follows Biohydromet '10 at the Vineyard Hotel, Cape Town, and is followed by Zinc Processing '10 at the same venue. Zinc Processing '10 immediately follows Process Mineralogy '10 at the Vineyard Hotel, Cape Town, and deals with all aspects of the processing of zinc ores and concentrates. The provisional programme is now available at the conference website.